If you like to spend your holidays screaming at the top of your lungs and fearing for your life then England is the destination for you! The country is filled with terrifying theme park rides ready to scare your socks off. 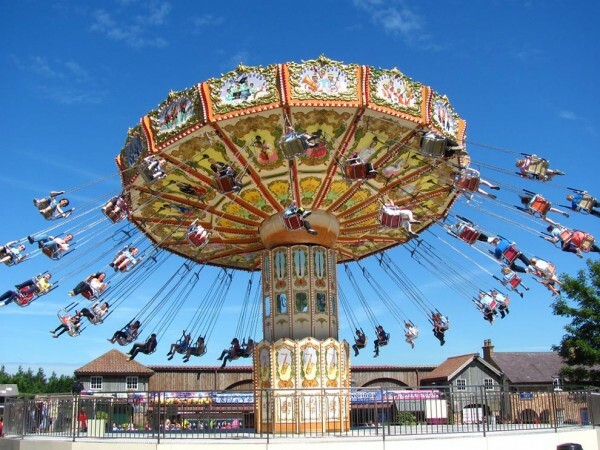 A day spent at Lightwater Valley will be filled with thrills and spills galore! This kid and adult friendly amusement park in Yorkshire aims to thrill, with the longest rollercoaster in Europe and Raptor Attack, one of the best dark rides in the UK. If terror isn’t your cup of tea try the towering Lightwater Wheel or the dodgems. For an altogether different theme park experience make a visit to Go Ape!, a high wire adventure course that will challenge both your fitness and your mettle. There are numerous courses across the UK, but the Grizedale Forest course is the highest among them, set as it is on the side of a hill in the Lake District. Go Ape! makes a great addition to a Lake District cottage holiday, adding a bit of excitement to an otherwise relaxing holiday. If you’re looking for extreme thrills then Thorpe Park will not disappoint. The newest ride to be added to the park is The Swarm, the UK’s first winged roller coaster! This coaster features a staggering 127 foot drop, which is sure to have everyone in your group screaming like a child. Alton Towers is the most visited theme park in the UK, and within the top ten in all of Europe! What draws over 2.6 million visitors to this Staffordshire park every year? This is the perfect kids and adult friendly theme park, with plenty of thrills for the grownups and lots of rides that are appropriate for the younger ones. There’s a water park here too, so you can all spend hot summer days being cooled by hundreds of water features. The slogan of Drayton Manor and theme park is ‘Total family entertainment’ and that is just what they offer. This well established park has been in operation for over 60 years and includes a theme park, resort, and zoo all set on the grounds of the former Drayton Manner in Staffordshire. Thrill seekers will love Europe’s only standing up rollercoaster, Shockwave, while the wee ones will love getting better acquainted with their favourite steam engine at Thomas Land.